8W May 1998 issue, offers are kindly accepted to extend the length of this article! This unfamiliar sight of a works McLaren in other than Marlboro red-and-white came courtesy of the deal McLaren made with the North American affiliate of Bavarian beer giant Löwenbräu. The first appearance of this unusual colour scheme was at the 1978 Long Beach GP, the second time at Montreal. This was also Hunt's last race for McLaren before replacing the Ferrari and World Championship-bound Jody Scheckter at Wolf in 1979. 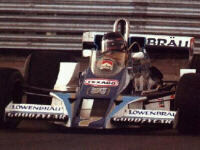 Löwenbräu Team McLaren graced the entry list one more time, at the 1979 Long Beach GP, this time with John Watson and Patrick Tambay sporting the Lions Brew colours in their increasingly uncompetitive McLarens.